5x7 inch Rickey Henderson baseball card distributed by the San Diego Padres exclusively at one 2009 home game to commemorate Henderson's Baseball Hall of Fame induction. NrMt or better condition. ONLY 10,000 CARDS WERE PRODUCED AND MOST WERE DAMAGED OR DISCARDED. 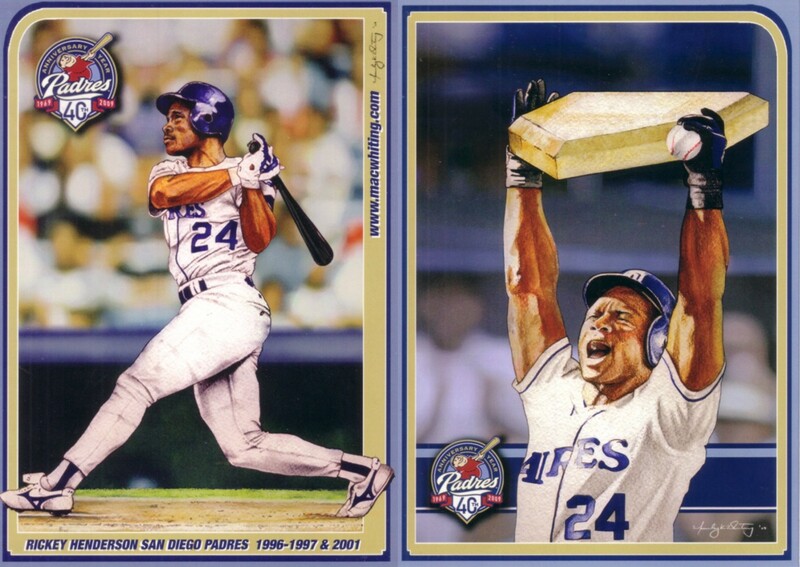 There is artwork on either side of the card featuring Rickey's two career milestones accomplished with the Padres in 2001: On October 4, Henderson hit a home run to become baseball's all-time career runs scored leader with 2,246 ... On October 7, Henderson collected the 3,000th hit of his career. THE ORIGINAL ARTWORK FOR THIS CARD WAS GIVEN TO RICKEY PRIOR TO THE GAME.